TTD Performed Srinivasa Kalyanam in Balaji Mandir, Naimisaranyam, UttarPradesh. Tirumala Tirupati Devasthanams TTD has performed the celestial weeding of the processional deities of Lord Malayappa Swamy with his two consorts Goddess sridevi and Goddess Bhudevi in a grandeur manner in Balaji Mandir, Naimisaranyam, Sitapur District, Uttarpradesh State, India. This colourful wedding festival was held on February 4, 2013(Monday) witnessed to the eyes of thousand of devotees. 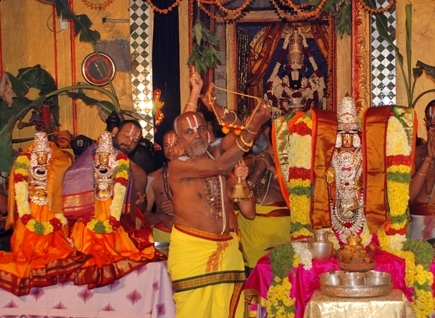 This celestial wedding began with the priests commencing the religious fete with Sankalpam followed by the traditional Hindu customary events including Edurukolu, Pubantata and finally Mangalyadharana(Mangala Suthra) Mahotsavam where in Lord Malayappa Swamy(Lord Sri Balaji) tied the knots to his Two consorts Goddess Sridevi and Goddess Bhudevi. Naimisaranyam is among the eight swayam vyakhta kshetrams and among the 108 divyadesams of Sri Vaishnavas. The place is also known as Nimkhar or Nimsar and is located on the banks of the river Gomati. Naimisaranyam Temple is said to be one of the 8 swayam Vyaktha kshetrams. The other swayam Vyaktha kshetram are 1) Sri Rangam, 2) Srimushnam, 3) Salagramam, 4) Thotadri (Vaanamamalai), 5) Tirupathi, 6) Pushkaram and 7) Badri. 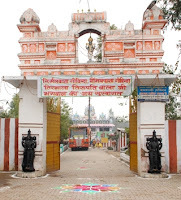 This Naimisaranya Temple is said to be regarded as 'Tapovanam'. There are 9 tapovanams. They are 1) Dandakaranyam, 2) Saindhavaranyam, 3)Jambhukaranyam, 4) Pushkararanyam, 5) Utpalaranyam, 6) Badrikaranyam, 7) Gurujangalaranyam, 8) Aruputharanyam and 9) Naimisaranayam. This Naimisaranyam is regarded as a holy forest and the Lord is in the form of forest. The Lord is known as Devaraja perumal or Sri Hari and the thayar is called Sri Hari Lakshmi thayar. The Vyasa ghat temple is located on the banks of the river. There are two pushkarnis - the Gomathi River and Chakra Theertham.